What is the Difference between a PAR and R/BR Bulb? How Can I Calculate How Many Lumens To Kelvin? How Many Lumens/Kelvins It Best For Garage? How Bright is 2700 Kelvin or 5000 Kelvin? What Is The Difference Between Lumens, Kelvins And Watts? Does A Higher Color Temperature (Kelvin) Bulb Produce More Light? What Is The Difference Between E26, E27 And A19? Can I Use a Dimmable LED Light Bulb with a Regular (Non Dimmable) Light Switch? How Much Heat Is Generated By LED Light Bulbs? Can I Use a T8 LED Tube in a T12 Fluorescent Fixture? Time to buy the best LED garage lights! In all honesty, using a torch to work on a car in your garage can prove to be difficulty sometimes. The lighting is not enough to facilitate quality repair or maintenance on your car. It is imperative to have superb LED shop lights to improve our performance and efficiency in the garage. LED garage lights are by far the best available courtesy of their longevity, brightness and energy saving engineering. And given their recent increase in popularity, their supply has also gone through the roof. Deciding on light replacement is as such quite confusing especially for beginners. But having taken a keen interest in the lights (I needed some for my garage), I have done advanced search and tests and put together a review of some of the top garage LED lights available. I have used these and experienced their performance first hand. Most homeowners dread the arrival of their electricity bill. But you do not have to be one among those who do. With light replacement to the HyperSelect 4ft. LED Garage Ceiling Lights, you can cut down on your electricity bill expenditure by replacing and installing this HyperSelect Garage Utility LED light. How does the unit save on electricity consumption? Well, the unit has a 35 W consumption. This saves you close to 65% on bills compared to the 100 W rating that conventional lighting options feature. In addition to this, it is important to note that the unit is rated to last for about 45,000 hours. This translates to about 21 years assuming the unit is on for 6 hours every day. If the amount of time it is in use is lower than this, then the average life span is longer. With this unit, replacing bulbs will be something you never have to deal with. You can thus save more over time in total. With regards to brightness, the unit will light up the garage clearly and with reduced shadows. The illumination rating of this unit is about 108lm/watt. The lumen rating is 3800 lumen. With this rating, the unit can illuminate a large area including storage rooms, workshops, warehouses, barns and garages. With this re LED light fixture, you get two color temperature options; 4,000K and 5000K. These offer a daylight and crystal white glow respectively. If you are a DIYer, a beginner or a professional, you will benefit from the plug and play design of this unit. The design ensures that the installation is a breeze and devoid of any hassles. The re LED light fixtures are made from aluminum and it has a linear shape and design. It measures 49x2x4-inches and weighs 1.1 pounds. With the 5-year unlimited warranty, you are covered. The long warranty is also a reflection of the manufacture’s trust in the quality of the unit. The brightness of this unit is through the roof. In the event you would love to mount the unit to your ceiling, it is recommended that you use a single screw and a bracket. But even with these tools, the installation process is a breeze and consumes very little time in total. 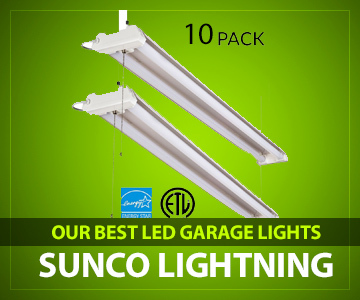 Sunco is one of those re LED lighting brands that one can purchase with confidence that it will perform as advertised. The fact that it comes with a 5-year warranty is proof enough that the quality of this unit is high. Sunco has been in the industry for quite some time now. In the time it has been operational and providing consumers with high quality LED lighting fixtures, it has learnt to adhere to the strict quality control rules and regulation thus guaranteeing excellent performance. Other than quality, what has this unit got to offer? Well, the Sunco 4 foot LED Lights are designed and engineered with long lasting material. This material affords it a whopping 50000 hours of service. And unlike most units available on the market and reviewed on the piece, it features an Instant On feature. While other brands suffer from a slow start, this LED lights turn on instantly without flickering. I am one individual critical to the effects of the products I use on the environment. I was pleased to note that this LED light is free from mercury and does not emit UV light. It as such is safe for both the environment and your home. Sunco LED lights are designed to conserve energy and save you from insane energy bills. The unit reduces the energy consumption by 65% compared to halogen and incandescent bulbs. Aside from reducing the energy consumption, it also helps to reduce harmful emissions contributing to the mercury contamination, global warming, nuclear waste and acid rain. But even while it is saving energy, it still provides quality light giving the traditional lighting a run for its money. It features a brightness of 4000 lumens and has a 5000K color temperature rating. The while light is natural and provides for a perfect working experience. And since most states do not allow home owners to install LED lighting without the energy star rating, Sunco meets all the necessary requirements and meets the strict quality, lifetime and efficiency criteria. The energy star rating helps homeowners to take advantage of the sales tax exemptions and rebates. With regards to installation, these led strip lights come with an instruction manual that ensures a fast and easy installation. Overall, it is more of a plug and play system. It features a 5’ plug in cord and does not require any wiring. It also comes with an 18.5-inch cord switch and does not make any humming sound when running. This is one of the best lights for garage on the market. Electricians and contractors prefer these LED strip lights for its quality, natural light illumination and brightness. So as to put together this piece, I took it upon myself to review several different LED brands available on the market. Of the many LED lights for garage I reviewed was the Hyperikon 38W LED Light. This, as I found out after some research and some use is that it is one of the best garage LED lights available on today’s market. It is by far everything that an experienced DIYer with a garage workshop would need to have a completely functional garage. Even better and impressive, this unit is designed to be easy to install.Now, let’s get deep into the review of this Led light. From the packaging, you will notice that it is rated to consume 38 watts of energy and has 4000 lumens. Going by these figures, you can tell that it is a highly efficient unit. The 4000 lumens ensures that the Led bulbs are bright while the 38W rating makes it energy saving. As a matter of fact, this unit produces as much light as a 100W conventional bulb but only uses up 60% of the energy. It is for this reason that the unit scores highly in energy certifications. Even more impressive than the bright light and energy saving abilities is its average life rating. This unit is designed to last for a whopping 45,000 hours. This is the base life it can provide you with service. It assumes that the unit is running for 12 hours a day. The 45,000 hours translate into 10 years. However, since not so many persons work for 12 hours straight in their garage at night, it only means that the 4 foot LED lights will last for even longer. This could be even 20 years without ever needing to be replaced. When it comes to setting it up, the unit is simple. Even more impressive is its ability to be linked with multiple fixtures. Honestly, garage lights tend to be difficulty sometimes to set up and install. There is always a problem with the wiring, tombstones or connection. The Hyperikon LED light however, gets rid of this problem with the plug-and-play design that it features. Overall, the installation of the unit can take a maximum of 20 minutes even if you are a beginner. In case you have just discovered this new LED light bulb technology, you should know that Hyperikon is one of the leading brands in the industry. It is arguably the most trusted LED lighting manufacturer in the world. Not only does the Hyperikon have a long list of energy certifications, its products are also used by some of the serious companies in the world. You can rest assured that the brand will provide you with the best there is on the market. The FrenchMay Linkable has been designed to provide sufficient and efficient lighting in your garage in the most cost effective manner. The unit is cheap and provides a bit brighter and healthier lighting compared to conventional lighting options including incandescent lighting and halogens. With regards to its brightness, it is designed with a 4800 lumen rating and has an output of natural light at 5000K. In addition to this, it features 40W wattage. These ratings are impressive. But even more mind blowing is its luminous efficacy at 120lm/W. The LED light has been designed to be durable and with a long lifespan. Its minimal operating temperature is -4F degrees. With this low temperature, you can rest easy knowing the unit will perform even through winter. Upon being switched on, it turns on instantly and does not flicker. The lighting is commercial grade and perfect for multiple uses. During installation, you may choose to wall mounts the unit or flush mount it or even mount it to garage door – the choice is yours. But whichever installation you choose, you can be assured of one thing, it is easy. Its ease of installation is courtesy of its plug and play design. With this unit, it is easy to daisy chain courtesy of the inbuilt power supply cords featuring 2-prong receptacles. Overall, the fixtures can last for about 22.8 years if they are turned on for 3 hours daily. Its aluminum build coupled with the thermoplastic design enhances the durability and impact resistance of this unit. Linkable LED Lights for garage are ETL certified, are durable and designed for pull chain mounting. They also feature daisy chain hardware included in their purchase box and have a board index. The Hykolity come highly recommended. It is one of the top products on the market everyone is making a big fuss about. After installation, the first thing one notices is that it is super bright. This unit comes with an impressive 4800 lumens. It is one of the top units with the highest rating LED lighting that I reviewed. It also features 5000K color temperature. This translates into daylight white and has a great LED efficiency of about 120 lumen/watt. I should point out that it has 40W rating. With this efficiency, it served a large portion of my garage with ease. But even with these high ratings, the unit saves you 75% on electricity bill. As for durability, you will be pleased to note that the unit is constructed using composite aluminum. This improves the longevity of the LED lighting. The unit will provide you with 50000 hours of lifetime. This can be longer if used for shorter hours on a daily basis. This aluminum design, in addition to offering durability, it also has great heat dissipation. The unit comes with a pull cord switch to turn the LED light on and off. This makes using the unit a breeze to use. While I bought it for my garage, I realized that with its rating and efficiency, it also can be used in workshops, storage areas, basements, equipment rooms and workbench areas. The unit proves easy to install and makes use of a plug connection to link multiple strip lights. The hanging hardware is easy to use and are perfect lights for garage. It features an instant on technology which most LED lights lack. The Hykolity LED lighting offers high and great performance. It has a long life and its energy savings are through the roof compared to conventional lighting units. The unit with a double integrated LED feature and board index is designed to provide you with a cheaper, healthier and better lighting compared to the fluorescent lighting. Can I Use a T8 LED fluorescent Tube in a T12 Fluorescent Fixture? For years, fluorescent lighting has been the go to option of most consumers. Being the cheapest option, they were used widely in most homes and offices. LED light technology during all this time has been considered too expensive with regards to the initial purchase cost as well as the installation costs. But in the recent times, the tables have turned. The LED strip lights seem to be more preferred and recommended by consumers and professionals alike. What is the reason for this shift? Well, here is a brief comparison between the two lighting options to shed some light on why LED lights are winning the battle. LED Lighting sometimes is with proper 30% more efficiency – with LED lighting, you not only get more lighting and brightness, but you also enjoy reduced wattage. 22W LED lighting performs at the same level as a 28-32W Fluorescent lighting. Doing the math, this is about 30% efficiency. Light from LED lighting is directional – LED lights emit light at an angle – 110 degree. Fluorescent bulbs on the other hand emit light at 360 degrees. As such, with fluorescent bulbs, only about 30% hits the intended target. The inference is that not all light emitted by the fluorescent bulbs is used. It is for this reason that they tend to be a bit brighter with reflectors. 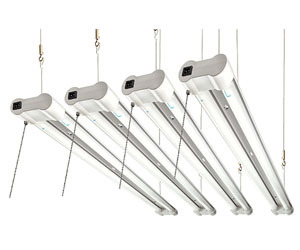 LED transfer light vs. heat – LED light fixtures use energy and convert it to light. Fluorescent lights, on the other hand, use heat to produce light. They as such waste a lot of energy. For this reason, they are losing popularity with most homeowners and business persons. LED Lights for garage still provide light at the end of their life – with fluorescent bulbs you can easily tell when they have reached their end. They will be dead, not producing any light. They provide light up to about 14,400 hours. LED lights on the other hand tend to provide service up to 50,000 hours. Comparing the two, LED lights tend to last about 3.5 times more. LED bulbs do not contain mercury. This is one of the major differences between the two lighting options. It is also one that affords LED lighting a great advantage. They help to reduce the amount of harmful mercury waste in the environment. LED lights do not emit UV. How is this a benefit you may wonder? Well UV/IR (invisible light), tends to cause colors on signage and fabrics to fade with time. This is in addition to causing eye fatigue and eye strain. LED Lights complements the efficiency of air conditioning. LED fixtures contribute little to no heat gain. Less heat means that the air conditioning system strains less. With improved AC efficiency, you have reduced energy bills at the end of every month or week. Both PAR and R/BR bulbs are the modern green solution courtesy of advanced technology for both indoor and outdoor lighting. They share a host of similarities.However, understanding their differences will go a long way to helping you make an informed decision about which bulb you will work best for you and meet your needs. But before we get into the similarities and differences, what do the acronyms represent? Well, PAR stands for Parabolic Aluminized Reflector while Br stands for Bulged Reflector. The R in R/BR stands from reflector. The BR light bulbs have a directional and soft edged light. This is perfect for light fixtures in a home, recessed can light systems and track lighting. The lighting by these bulbs is highly precise and as such, less shadows are produced compared to lighting with PAR bulbs. The PAR lamps on the other hand do deliver a strong, wide and narrow directional light. They are used as aircraft landing lights, for indoor concerts, security lighting, theatre and movie production. There are some LED PAR bulbs that save about 90% of energy compared to halogen bulbs. They produce low heat and can last for a whopping 70,000 hours. To make an intelligent decision, consumers must be aware of the new light bulb rating lingo. In today’s lighting industry, companies are required to rate their bulbs with lumens, life hours and light temperature (kelvin). Very few brands use watts alone to describe their bulbs. That said, how does one make the conversion of lumens to kelvin? Well, there isn’t a direct mathematical formula for it. This is because the two ratings represent different characteristics of a light bulb. Kelvin is a measure of the color temperature. This is basically the whiteness of a bulb’s light. Lumens, on the other hand, is a measurement of the brightness of a bulb. Generally, colors between yellow and red are considered warm while those between blue and green are considered cool. Generally, the high kelvin temperatures (3600k-5500k) tend to produce cool white tones while lower kelvin temperatures (between 2700k and 3000k) produce warm white tones. Now, coupled with wattage, a bulb with a 26 watt and 2700L will have about 1800 lumens which is still what a 26 watt 5000K bulb will produce. So in essence, a higher Kelvin rating does not necessarily translate to a bit brighter bulb. Now, given their reference to difference factors, it is not possible to make the conversion. It will be the same as trying to convert kilometers to kilograms. The amount of lumens you will need for your garage is entirely dependent on the size of the garage. There are two systems of determining how much lumens you will need for your garage. These are the Lux (metric system), and the Footcandle (imperial system). Lux is a measurement of illumination. In other words, the measure of how much light is shown on a given surface. 1 Lux is equivalent to 1Lumen per Square meter. Footcandle on the other hand is the same as Lux, only instead of using square meters, it uses square feet. Now different rooms on a house require different lumens for comfort, safety and charm. For the garage, this value is 108 lm/m2 or 10 lm/ft2. As stated above, Kelvin is not a unit used to measure the brightness of a bulb but rather one used to measure the color temperature of light emitted by a bulb. If you are looking to determine the brightness of a bulb, you should be looking at the lumen rating. With that said, you should generally expect a 5000K bulb to be brighter than a 2700K LED bulb, all factors kept constant. But this is usually as a result of the increased contrast of the 5000K light, whereas 2700k led is softer. Given the changes in light industry with regards to bulb rating, more and more shoppers and consumers seem to be confused about these three specifications; Watts, Lumens and Kelvin. In this piece, I have already differentiated between Lumens and Kelvin. But just a quick recap, lumens is a measure of brightness of a bulb. Generally, the higher the lumens, the brighter the bulb. Kelvin is a unit of measurement describing the color temperature of the light emitted. The specification is all about the coolness and warmness of light from a given bulb. Now, watt is a measurement of a bulb’s power supply consumption. With the incandescent light bulbs, high wattage depicted brighter light. However, with LED energy efficient bulbs, this is not quite the case. With the LED bulbs, there isn’t a direct method of relating wattage with the output. How so? Well, for instance, one LED bulb may have 9 watts and emit lumens equivalent to a 60 watt incandescent bulb. However, a less efficient LED bulb may produce 12 watts only to provide the same 60 watts. By now you surely get the drift and the difference between lumens and Kelvin. Now, LED fluorescents with a high Kelvin rating may seem brighter. But this is as a result of the high contrast that the cooler light offers. However, with regards to brightness, these bulbs are often equal or just a little bit brighter when considering the lumen unit of measurement. The choice of the Kelvin rating should be made on the basis of the color of light needed. Generally (though there are some bulbs not fitting this general rule), a 2700K bulb has a soft white colored light and a 4000K or higher will provide a high contrast light or more daylight resembling light. This is yet another confusing LED specification and rating for most consumers. Before we start deciphering these specifications, you should understand this; the E26 and E27 refer to the base type while the A19 refers to the bulb shape. The screw in bulbs feature a base commonly referred to as the Edison Screw or the ES base. The base was designed by Thomas Edison and is still in use today. The numbers that come after the E refer to the size of the external threads in mm. As such, the E26 features a 26mm diameter base. You might have come across some cheap LED bulbs sporting an E27 base type from foreign supplies on amazon or on eBay. The E27 base types will still work with the E26 bases. This base type acts as a clear indication that the bulb was not designed for the United States Market. As such, the bulb might fall short of some crucial North American safety certification. Avoid purchasing a bulb without a base type from your continent. The ‘A’ in the A19 refers to a bulb shaped like a pear. The number following the ‘A’ (in this case 19), describes the width of the bulb in 1/8th inches or in mm at its widest point. The A19 bulb sports a 2 3/8- inches or 60mm wide and about 4 3/8-inches or 110mm in length. This is the most common light bulb shape. LED light technology has come a long way. Today, they come with dimmable and non-dimmable options, something that the incandescent and halogen bulbs cannot brag about. When the LED bulbs were first introduced in the market, they only came with the non-dimmable options. But as engineers understood the internal electronics and technology advanced, dimmable options were introduced into the market. Today, the dimmable versions are not exorbitantly expensive compared to the non-dimmable units. As a matter of fact, there is a slight difference in price. But the question is, can one use dimmable LED with a non-dimming switch. The answer is a resounding yes. The lack of dimming technology in the switch does not in any way interfere with the operation and efficiency of dimmable LED light bulbs. As such, the dimmable LED light will function at its optimum output capacity. It is also worth pointing out that the dimmable LED light options tend to last longer in comparison to the non-dimmable LED light bulbs. Now you probably are wondering if the reverse can work. Can one use a non-dimmable LED light bulb with a dimmable light switch? Well, yes. When the switch is turned on to its fullest, the non-dimmable light bulb will work perfectly. However, any attempt to dim the bulb will result in the non-dimmable bulb displaying some erratic behavior including but not limited to buzzing and flickering. If you decide to make this installation, ensure the switch remains fully turned on. Courtesy of advanced technology, we have dimmable LED lights. You should note that dimming incandescent bulbs is different from LED light bulbs. When you dim LED light bulbs, suing only fraction of the power, you will notice that there are smaller diming ranges which is usually between 70 and 90% vs. the 100% the incandescent bulbs can be dimmed. With LED bulbs, they do not necessarily have to dim to their lowest setting. This is mainly because the dimmer switch interprets the low wattage consumption by the LED bulb for being shutoff. Last but not least, when using dimming systems that rely on the Power Line Carrier control tech, the LED bulb might flicker. This is because of fraction of the power fluctuations experienced in the dimming process. When you are purchasing a LED bulb, you should test its working with your dimmer switch. There are high chances that they will work well together. But be it as it may, you cannot afford to take the risk. If you experience any issues as explained above, you should choose a different type. The Lutron CL dimmer series are however bound to work wonders for you when all else fails. Most LED light brands market their products as non-heat emitters. But contrary to their marketing, I realized that LED bulbs do produce some amount of heat. This applies for all products that produce heat. However, they do consume minimal energy compared to halogen or incandescent bulbs. In addition, they are much more efficient in their energy use. Now, back to the heat produced. The amount of heat produced by LED bulbs is minimal. The temperature of the LED Bulb external housing will be influenced by the room as well as the fixture contained in the bulb. LED light bulbs feature numerous components designed to convert high electricity voltage from your home to low voltage used by the LED chips. As such, they tend to be a little bit too sensitive to the heat than halogen and incandescent bulbs. With low quality and low cost LED fluorescents, you will notice that they come with a warning. They should not be placed in a fully enclosed fixture. The heat buildup inside them will shorten their lifespan or damage the bulb altogether. Using enclosed fixtures just might render its warranty useless. All in all, the fact that these re LED bulbs emit minimal heat makes them perfect for use with items that are heat sensitive. These include artwork and foods. The main difference between the non-shunted tombstone and the shunted tombstone is the way in which the electrical current flows through the unit. in a shunted tombstone, current flows in a single path. In a non-shunted socket, it flows through multiple paths. If a mistake is made and the wrong socket is used chances are, an electrical short circuit may occur or early damage of the bulb. Both the T12 and the T8 sport a G13 bi-pin connector. The T8 measures 1-inch in diameter while the T12 tubes are 1.5-inches. To help make these LED tubes compatible with most of the internal measurements of these fixtures you will notice that most LED tubes are T8 meaning that they have a 1-inch diameter. They are as such compatible with T12 fixtures. 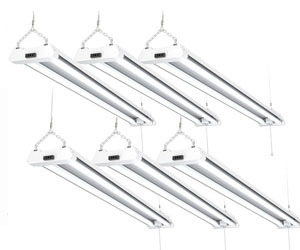 The T12 fluorescent tube on the other hand, feature magnetic ballasts. 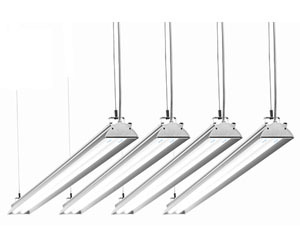 As such to use your LED tubes with this fixture type you have to either buy a universal magnetic ballast compatible tube or an LED ballast bypass tube then bypass the said ballast wiring. Lighting could very well be the difference between a bad and a good job well done in your garage. Depending on the type of tools you use, it may also be the difference between injury and health. But regardless of where you spend most of your time, you should make it an objective to get the best re LED fluorescents. The above review and guide will help your advanced search of the best LED shop lights on the market. Kindly post reply in comment section below.